First of all, we are going to prepare a balsamic vinegar glaze. 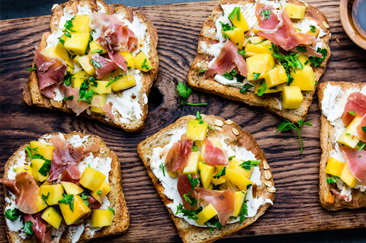 Once vinegar and bread are ready, put the slices of bread on a tray and add the ingredientes over them following this order: duck ham slice, mango, pistachio dust and a few drops of balsamic vinegar glaze. Easy and quick. Ready to eat!